Paw Pods' Classic Urn is an eco-friendly burial urn designed for pets, providing a respectful, dignified way of laying them to rest. A proper burial can provide closure and help with the transition of loss, especially for children. Each Paw Pod Urn comes with a seeded leaf that grows into a lasting memorial of wildflowers. The passing of a pet can be a terribly painful time, but being able to lay them to rest in a respectful, dignified way often provides closure and helps us heal. Paw Pods are eco-friendly, affordable burial pods designed just for pets. When Founder Ben Riggan’s dogs had to be put to sleep due to age-related health problems, they were returned to him in blue “cadaver bags.” The impersonal treatment made a hard experience that much harder, so Ben created Paw Pods as a better way for vets to handle the remains of beloved family pets. Now Paw Pods are available to everyone in multiple sizes and urns. Pets are often a child’s first experience with the concept of death—whether a goldfish, turtle, cat, or dog. A proper burial can help kids transition through a time of confusion and loss. Paw Pods can easily be painted or decorated to celebrate your pet’s life, and they allow you to bury them in a meaningful place of your choosing. Paw Pods are made from 100% biodegradable bamboo and rice husks, but are durable enough to protect from curious wildlife. Each one comes with a seeded memorial card to bury with it, transforming the site into a tribute of wildflowers. 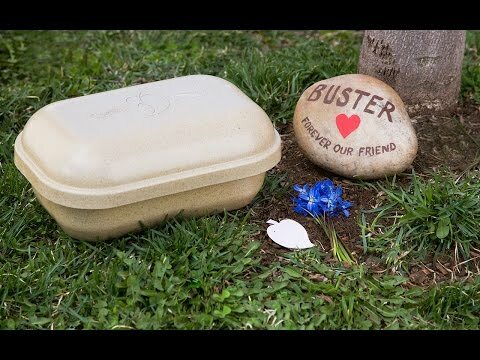 Say goodbye with love and respect and watch your pet’s memorial bloom.